Owner: Pacific Baseball Ventures-Yakima, LLC. President/COO: Zachary Fraser. General Manager: Jeff Garretson. Assistant Coaches: Beau Kerns, Eric Hull, Jaime Cortes. 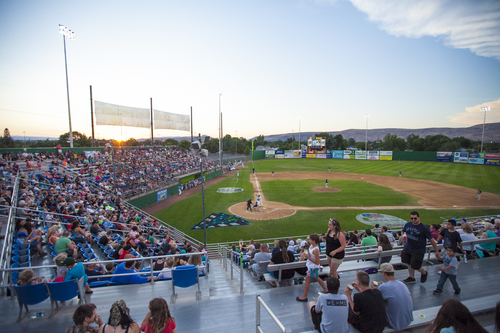 Ballpark: Yakima County Stadium ("The Orchard"). Address: 1220 Pacific Ave., Yakima, WA 98901. Dimensions: LF- 293’ LF Gap – 365’ CF – 406’ RF Gap – 375’ RF – 293’. Signature: Hunky Shaw’s Team Shop (named after first Yakimian to play in MLB and team president of original Pippins in 1937), 16’ Outfield Wall and 50’ Video Scoreboard. 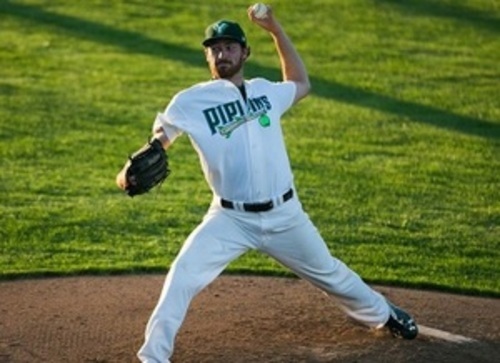 Reed Garrett pitched for the Pippins in their expansion season before signing with Texas and making the short trip to Spokane to start his professional career. A 16th-round pick out of VMI in 2014, Garrett began the 2017 campaign with the Frisco RoughRidgers (AA). He split his 2016 season between High Desert (advanced A), Frisco, and Round Rock (AAA). Southpaw Zach Draper of Yakima Valley earned WCL Pitcher of the Year honors in 2016. The senior lefty led the league in wins with 8 and went undefeated over 12 starts. 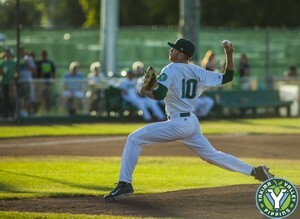 Draper posted a league-low 0.73 ERA, was second in the WCL in innings pitched with 71.1 and led the Pippins to the post-season. 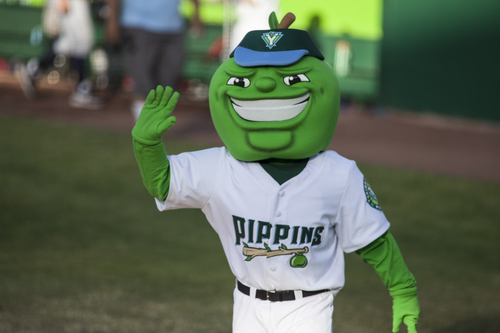 Yakima County Stadium was built in 1993, with more than $100,000 in improvements in 2014 during the Pippins’ inaugural season. Constructed with 2,700 permanent seats, the venue includes two concession stands, a barbeque stand, four restrooms, a covered picnic deck for large groups, two bars, an elevator with direct access to fan level and sits adjacent to a paved parking lot that can accommodate 1,500 vehicles. The nontraditional playing field configuration is bordered by a 16-foot outfield wall, topped by a 50-foot video scoreboard in left field. Must Easts: Restaurants throughout Yakima can please any palate, from burgers and fries to Italian or French cuisine – there’s something for everyone. Gasperetti’s Gourmet Restaurant celebrates its 50th anniversary in 2016 and has been a premium destination for Italian food. In historic downtown Yakima, Cowiche Canyon Kitchen and Icehouse is a new favorite for cocktails and cuisine, joining 2nd Street Grill, Carousel French Cuisine, Mel’s Diner, 5 North, Santiago’s Gourmet Mexican Restaurant, the Barrel House and Yakima Sports Center as must-stop locations when visiting the city. Local Wineries: Rich volcanic soil and talented farmers have created a wine growing culture in the Yakima Valley that is a filled with variety and sure to please all palates. The region is home to many varieties of grapes and several wineries and tasting rooms are in close proximity to downtown Yakima. Visit Kana Winery, located next to Hunky Shaw’s Team Shop in downtown Yakima. Places Worth Visiting: Kana Winery tasting room, Gilbert Cellars tasting room, Tieton Cider Works, Yakima Electric Railway Museum, Yakima Valley Museum, downtown Farmers’ Market (Sundays, May-October), the Capitol Theatre. Local Media Outlets: Yakima Herald-Republic (newspaper), KNDO/KIMA/KAPP (TV), Townsquare Media, Radio Yakima (radio). 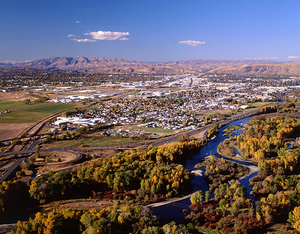 No trip through Central Washington is complete without a stop in the Yakima Valley – or, as the billboard along Interstate 82 reads, “The Palm Springs of Washington.” While downtown Yakima offers a variety of activities for tourists to take in, the entire valley can make for an excursion to remember. Whether you enjoy touring wine country, riding old-fashioned trollies or seeing the diverse landscape of the valley, chances are good that you can find something to meet your needs. The Valley is one of Washington’s centers for agricultural production, especially apples and hops.